Located on the N70 main Ring of Kerry route, about 4 miles west of Kenmare, overlooking beautiful Kenmare Bay. 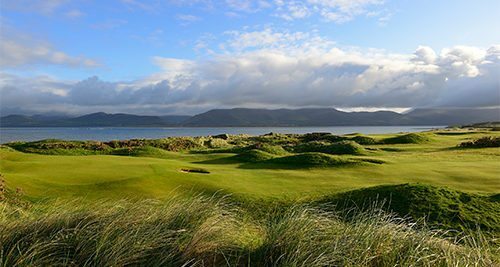 Famed for its spectacular scenery and the intoxicating hospitality of the Kerry people, the Ring of Kerry Golf Club provides an experience not to be missed by any discerning golfer visiting Ireland’s South West. As you make your way around this par 72 championship course the demands of the golf are equally matched by the breathtaking scenery. 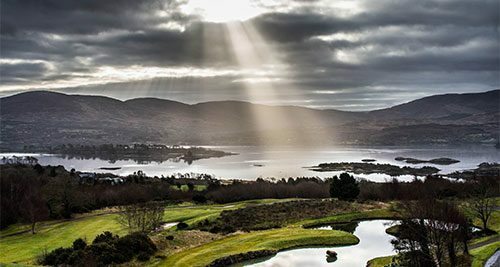 Overlooking Kenmare Bay and nestling between the Caha Mountains and the McGillycuddy’s Reeks, the panoramic view at Ring of Kerry Golf Club has to be seen to be believed. 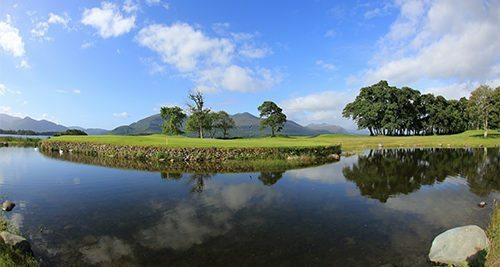 You will experience some of the most scenic holes in Ireland, ranging from the dramatic tee shot on the 6th hole ‘Ladies View’ to the stunning backdrop of the par 3 13th ‘An Neidin’. 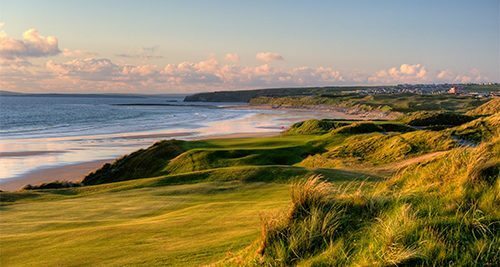 Ballybunion’s Trent Jones Cashen Course, located along the sweeping, undisturbed shoreline, was founded in 1981 and offers breathtaking views throughout. There is a wild look to the place. Long grass covers the dunes that pitch and roll throughout the course. With its succession of formidable par fives and breathtaking beauty, amply qualifies as one of the world’s masterpieces. Every hole, every hazard and every shot is defined by nature’s infinite presence. Located 8 miles south-west of Killorglin off the N70 Ring of Kerry route. Golf has been played here since 1889 and the course represents traditional Irish links golf at its best, offering the visitor a unique links experience in a majestic environment. The golf links is set out on one of the three stretches of sand dunes at the head of Dingle bay. In the immediate foreground are the sand dune peninsulas of Rossbeigh and Inch and just a few miles away the whitewashed houses of Cromane fishing village provide an eye catching distraction. South eastwards are the famed McGillycuddy’s Reeks, to the Southwest are the lovely cooms and hills of Glenbeigh and across the bay to the north are the Slieve Mish and Dingle mountains. Killarney Killeen is one of two parkland courses at Killarney Golf & Fishing Club, located 3 miles west of Killarney Town. It is nestled amidst the splendour of the famous Killarney lakes with the spectacular backdrop of the Macgillycuddy Reeks, the highest mountain range in Ireland. The Killeen Course is the jewel in the crown, offering spectacular lakeside scenery but is the most challenging of the three. It is consistently rated amongst the world’s top courses. At 7252 yards it will challenge long hitters with accuracy being vital as there is water on virtually every hole. Killeen was the host venue of the 2010 and 2011 Irish Open with England’s Ross Fisher and Simon Dyson emerging the respective winners. This was our best golf trip ever in 8 years. The weather was 100%, it was perfect. The hotels were mind blowing at Rosapenna and RCD. Everyone thought it was quite a step up for us – Great Hotels. All the courses were superb and the staff at Ballyliffin was so organized and very polite and friendly. Everything went well and Kevin our driver was a great lad. Ballybunion offers an excellent selection of top bars and restaurants to choose from in the town. Top options would include McMunn’s Bar & Restaurant, Strollers Bistros, Kilcooly’s Bar & Restaurant and Daroka. The options vary from traditional “pub grub” to fine dining. These beaches are also popular amongst equestrian enthusiasts. Indeed, horse riding is a popular option amongst locals and tourists alike. There are plenty of trekking options available, and if you’d rather not experience the exhilaration of a beach ride, there are plenty of stunning woodland treks to choose from. In the town itself, the traditional music scene is thriving and the town’s pubs are worth a visit for those looking to explore the best of Irish culture. As host to the 2006 World Fleadh, the town has a lot to offer. Alternatively, the town’s theatre holds performances of traditional Irish dance, music and literature. Dooks Golf Links is located along the Ring of Kerry and if you would like to take in some sights either to or from your round, there are a number of shortened routes you can take between Killarney and Dooks. Rossbeigh, one of Ireland’s finest beaches, is located a short drive from Dooks. If an insight into Ireland in the 18th century would be of interest, a visit to the Bog Village is a must, only 5 minutes from Dooks Golf Links, the village gives you a fascinating insight into how people lived and worked in Ireland in the 18th Century. The village is the only one of its kind in Europe and is one of Kerry’s leading tourist attractions. Ideal for families and tourists with spacious parking and a restaurant and bar onsite. The Ring of Kerry is famed for its unique mix of both natural beauty and rich historical charm. Any trips in the county will prove rewarding for any nature and history buff, and there is an almost limitless diversity of places to go to and things to do. Off the coast of Kerry lie the forbiddingly impressive Skellig Rocks. Rising from the Atlantic Ocean to an impressive 700 feet high, the rocks are home to vast colonies of seabirds, (the gannet colonies number around sixty thousand in total). Below, at the base of the cliffs, families of seals huddle which, if you take a boat trip from the coast, you will see on your way to the landing strip at Skellig Michael. From here you will scale 600 6th century steps en route to one of the oldest monasteries in Europe. These impressive geological features have recently featured in the 2015 Star Wars prequel, The Force Awakens. One of Ireland’s most westerly points, Valentia Island is an area of outstanding beauty, offering unparalleled views of the Kerry coastline. The western part of the island is largely occupied by the karst landscape of the Burren. The contrast drawn between the two halves of the island is one that mimics the entire West of Ireland, although on a smaller scale. Other sites of interest in the region include the nearby town of Waterville’s Craft Market, Derrynane House, the stunning conservation zone of Rossbeigh Beach, the popular tourist trail Iveragh Peninsula, and the Ring of Kerry itself. Killarney which has about 50 pubs, so it’s no wonder that this little town in the south-west of Ireland is one of the top destinations in the country! This is quite a number considering that Killarney is a small town, so you’re sure to find something to suit your taste. From traditional Irish pubs to lively disco bars, Killarney is sure to not disappoint. Some of the best would be The Danny Mann for Craic agus Ceol (Fun and Music), K-Town Bar for Live Music, The Grand Hotel Bar & Nightclub for great bands and late night fun, Buckley’s for Real Traditional Music, Murphy’s for Drink, Food & Entertainment and Tatler Jacks for some live sport. The selection of top restaurants would rival the bars, with options from Pub Grub to al-a-carte to fine dining, there is an option for every taste. – Valid for 2018 at different rates depending on travel dates. Exchange rates are only approximate and will be subject to change at the time of booking. – All courses and hotels are subject to availability at the time of booking. Ballybunion Golf Club closes for the season on October 5th 2018. Other courses, accommodations & services (e.g. transport) can be added to the above on request.